The New Edition Story may have signaled that BET is in the original-content game for real. But the truth is, the network has been slowly working at this for years. And history, not music, has been the main driver when it comes to the miniseries that air on the network. Reportedly, great viewer reception to the reairing of Roots, as well as Roots: The Next Generations, Roots: The Gift and Queen back in 2012, helped BET join forces with the Canadian Broadcasting Corp. to produce The Book of Negroes. Based on a novel by Canadian author Lawrence Hill, the miniseries aired to some acclaim in 2015. Hill built his impactful work around the actual Book of Negroes, a historical record of enslaved Africans who helped the British and were granted their freedom in Nova Scotia. And this year, BET is keeping the momentum going with Madiba. Starring Laurence Fishburne as the internationally celebrated freedom fighter Nelson Mandela, Madiba, which airs over three weeks—Feb. 1, 8 and 15—is based on two Mandela autobiographies: Conversations With Myself and Nelson Mandela by Himself. It was filmed in South Africa, including Robben Island, where Mandela was imprisoned for nearly three decades. The Kevin Hooks-directed miniseries is touted as one of the most personal portrayals of Mandela to date, as well as the first major production about the legend helmed by an African-American director. Productions about Mandela—who rose from being a leading anti-apartheid activist with the African National Congress, resulting in a lengthy imprisonment, to become South Africa’s first democratically elected and first black president—have been prominent. In 2013 Idris Elba starred as the icon in Mandela: Long Walk to Freedom. Morgan Freeman famously played the great leader in the soccer-themed Invictus, directed by Clint Eastwood, in 2009. And Terrence Howard got a shot at portraying him in Winnie Mandela, the T.D. Jakes-produced film about Mandela’s famous second wife starring Jennifer Hudson, released in 2013. And now Fishburne, who is best-known these days as Pops from the ABC hit sitcom Black-ish, is taking his turn. The miniseries spans the period from Mandela’s life as a child until his historic election as president. 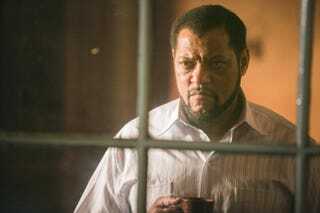 Except for a very brief time, the 55-year-old Fishburne plays Mandela from roughly his mid-20s until his mid-70s. As strong an actor as Fishburne is, this move doesn’t necessarily bode well for the first installment of the miniseries. But as it plays on, the story and his age gel more. Also, unlike other Mandela productions, his comrades are particularly prominent. So fellow ANC activists such as Walter Sisulu, who is credited with bringing Mandela into the ANC and is played by David Harewood from the series Supergirl, as well as nonblack comrades Joe Slovo (Jason Kennett), Ahmed Kathrada (Meren Reddy) and Ruth First (Kate Liquorish), make an appearance. Orlando Jones, who plays Mandela’s law partner and closest friend, Oliver Tambo, is surprisingly outstanding—actually, unrecognizably so. It may take a while for Drumline’s Dr. Lee to register, if he ever registers at all. Terry Pheto, who plays Winnie, is the rare black South African in a prominent role, and she is particularly compelling, especially in the final installment. For those familiar with Mandela’s history and that of the ANC, there will be no real surprises. Madiba—“Madiba” is Mandela’s Xhosa name (Xhosa is South Africa’s second-largest ethnic group after the Zulus)—is a pretty faithful history, capturing key moments like Mandela’s early rise to prominence; his role in radicalizing the ANC; his Rivonia trial, which sent him and his comrades to Robben Island; his time at Robben Island, as well as the Sharpeville massacre in 1960; the Soweto student uprising in 1976; the questionable death of popular leader Steve Biko; and the assassination of youth leader Chris Hani. A recurring theme is the stress Mandela’s activism placed on his wives and children. It is very clear that Mandela’s activism came at a huge personal price. The increasing tension between him and Winnie is particularly compelling. While BET should certainly be commended for stepping up to the original-programming plate in such a big way and for recognizing the need to tell historic black stories of the United States and the African continent, a Madiba miniseries exploring Mandela’s presidency, the changing South Africa and his death might have been a better approach. It’s not that this one isn’t of value. After all, if U.S. schools barely teach black American history, they certainly don’t teach South African history. And one of the most enlightening aspects of Madiba is the obvious parallels it makes to the civil rights movement of the 1950s and 1960s and the rise of black nationalism in this country. At times, Mandela is both Martin Luther King Jr. and Malcolm X, but toward the end he is a little Obama, too. Ultimately, the folks at BET are banking that, when it comes to anything Mandela, they just can’t go wrong. And here’s hoping they’re right. Madiba airs on BET on Feb. 1, 8 and 15 at 8 p.m. ET/7 p.m. CT.